Vacation time is here but off to a ruff start. Well I am on vacation for a week, I normally go to Diva Las Vegas each year and I always save 2 weeks of vacation for that but this year I couldn’t go because of the dates so I found myself with vacation time I have to use or loose so I took this coming week off for some Susan time. I was really looking forward to it. The bad thing is my vacation actually started after about a half day on Thursday as I got sick earlier in the week and by Thursday I was really not feeling well and left early to go to the doctor. Nothing too serious but I will be on antibiotics for a touch of bronchitis for several days. Not how I wanted to start my vacation. My plan was to go to the nail salon Friday and get a manicure and pedicure and although I wasn’t going to get acrylic nails I had kind of let my own nails grow out a little long to where they should be able to shape them and give them a nice feminine look. I was also going to get gel polish for the week in color. Well Friday I was just not feeling up to it and it takes a lot for me not to feel like being Susan, as a matter of fact I didn’t feel like being Susan all week. Well Saturday came around and I was feeling better so I decided I would make an appointment for Saturday at 5 and get my nails done and then depending on how I felt maybe go to the Escape for a while. I called Dream Nails and made an appointment with Anna for 5, she does a really good job but all the ladies here are really friendly of course I have been going here now for every 5 to 6 weeks for about a year in a half now. Now I know what you are thinking should I be out being sick, the doctor told me that I should be fine around people after I had been on the medication for 2 days and as I started Thursday afternoon I figured I was fine plus the medicine controlled my cough which is the big issue. I got ready and yes t did take a little longer as not doing any of the upkeep for Susan over the past week took a little longer today. I was ready by 4:30 which gave me time before I left. I got there right before 5 and as usual they were busy. 1 lady waiting and 6 getting their nails done, 3 pedicures and 3 manicures so I am glad I called for an appointment. I picked out my color which was Ferrari Red. Anna finished the lady she was doing and got me in the pedicure chair just a couple minutes after 5. 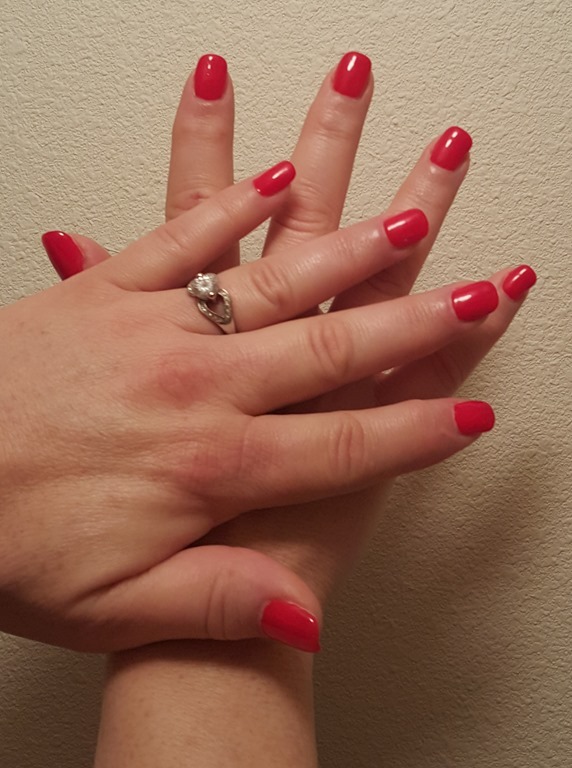 I so love going and getting my nails done, it is such a wonderful experience. I struggle sometimes with the cost though as today will be $50 plus tip and as I have to hid my toes in my male life and normally I just get a clear coat on my fingers which I put a matt polish over to hide the shine and normally I keep my nails some what short well maybe just a little long for a guy. I question myself is it worth the money. I wouldn’t question it at all if I could have pretty long nails all the time even as a man but I did spend over $600 last years at the nail salon which is a lot when you really thinks about what I get except for one thing. I enjoy it and it makes me happy. This is something that a lot of woman do and probably don’t think about in and very few men will ever enjoy. This is my vice, addiction or obsession, call it what you want but I like it and it doesn’t hurt anyone. How knows maybe someday men will be able to show off pretty nails and life will be awesome then. Now I was at the pedicure chair at the front of the salon, 3 chairs down from me was another lady and 2 chairs down from her was a man and woman. Now this is the second time I have seen a man here getting a pedicure. Anna started on my feet and as always did a great job. it is so relaxing, she removed the old posh which only had 2 small chips of course it has been just a little less than 5 weeks since my last manicure and pedicure. Then she trims the nails, pushes back the cuticle and trims them. Then comes the fun part, the salt scrub, oil and lotion and then the lower leg message. It is so relaxing. to finish it off there is a hot towel and the a hot rock message. the result my lower leg looks incredible and feels so soft and silky and it will feel this way for a couple days. 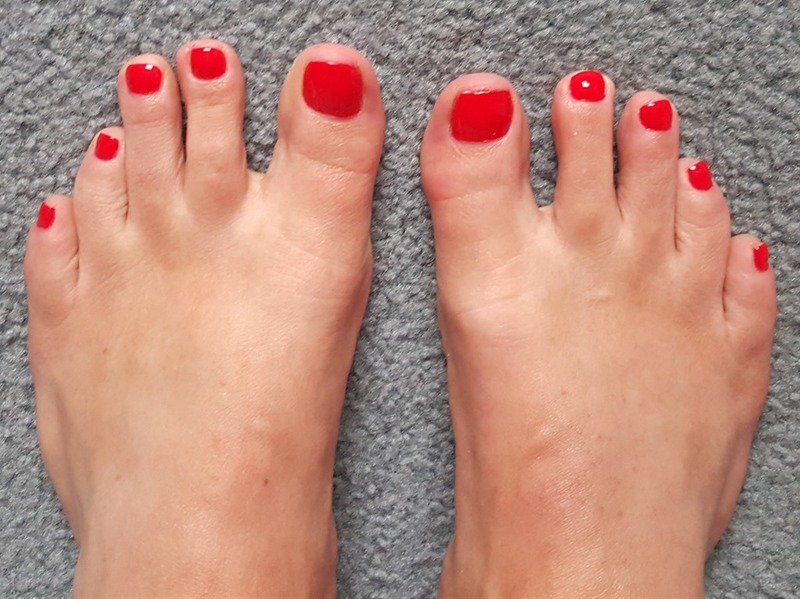 I love that feeling Next she started to paint my toes with the Ferrari red. 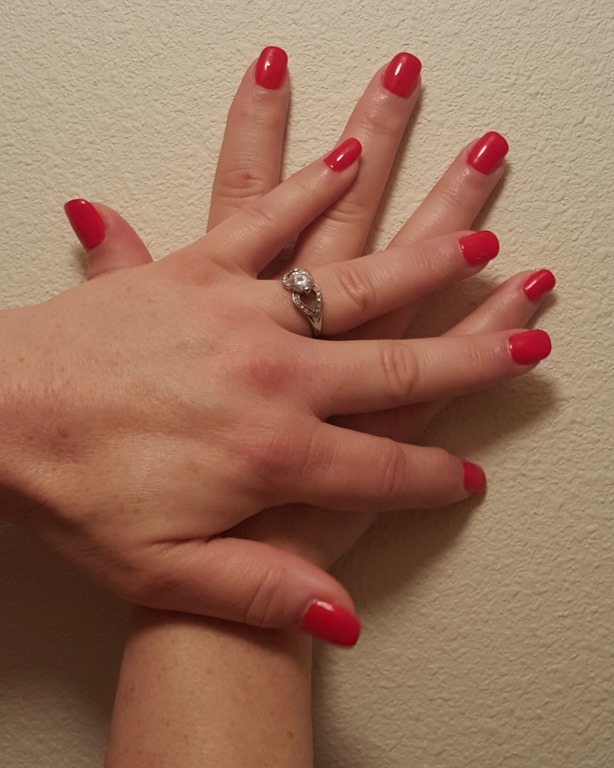 it is a really bright and beautiful red color and I could think of no better color for Valentines day. I really think all feet look better with nice toenails and a pretty color. As she was finishing painting my toes the man and woman from the end walked by, they were all done. The woman had a beautiful pink on her toes and the man had almost a black color. Not a color I would pick but he did have color on his toes. Now I moved over to the manicure table and Anna asked if I wanted gel polish again and I Said yes. She started by roughing up the top of the gel polish that was still on and then put little pieces of cotton with acetone and then held them on with little plastic clamps to soften the old polish. It is a strange feeling to sit with your hands like that as you can’t do anything with them. Anna went and cleaned the pedicure spa before coming back to scrap off the old gel polish. As she worked on my hands she said Clear gel again. I looked at her and said no I was thinking the same red I had on my toes. I actually saw a smile on her face. She shaped my nails to a square tip, they are not real long but have a nice shape to them and then pushed back the cuticle and trimmed them. they looked nice. 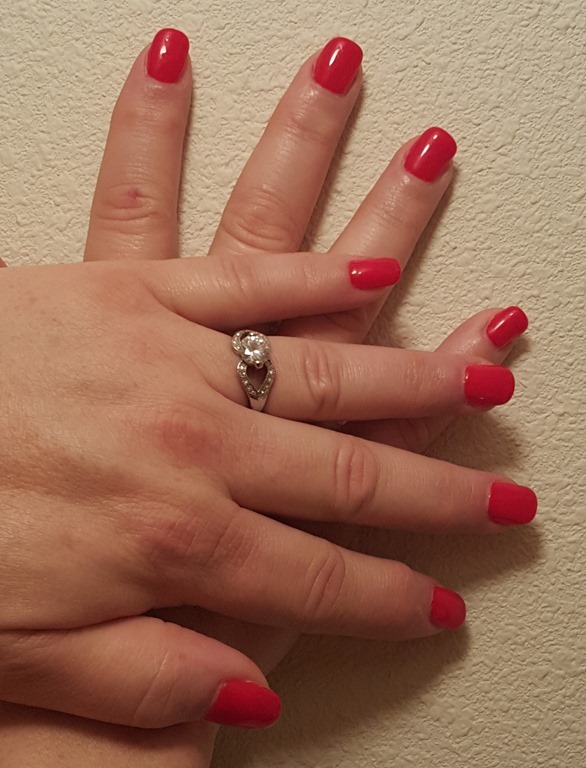 she then went and got the Ferrari Red gel polish. She started off with a clear base coat, now the good thing about gel polish is you fry them in an ultra violet light dryer and it only take 30 to 60 seconds to dry them completely between applications so as she paints one hand you dry the other so it goes really quick. once the clear base coat was done she started the color, 2 coats of the Ferrari Red and then a high gloss clear top coat. took about 10 minutes and I had beautiful red finger nails and they were completely dry. No worrying about smudging the polish. the came the same oil and lotion message on my hand and forearm. It was a wonderfully relaxing experience. It really was worth the money. it took about an hour and 10 minutes for the whole thing and I had pretty fingers and toes. now the one bad thing about gel polish is you can’t just remove with polish remover. you have to file off the top of it and then soak it off with acetone. and that takes time but I should be able to keep them for the week. I paid for my nails and I was on my way. it was a fun night and just what I needed after being sick last week. Wow really wish I could keep them like this all the time. Now I thought about going to the Escape as it was about 6:30 now but I am still not feeling great and I really want to be able to get out this week so I went through the drive through at Panda Express and got some food as I have been living on soup the last several days and I was hungry which I guess is a good sign and then I went home. It was a fun time and just what I needed to feel better. I will probably rest tomorrow so I can go out during the week. I really need to do some shopping as some of my makeup is getting low and I really do want to buy some new outfits. I may even go to a movie this week. It is hard to believe looking back at my blog how many times I have blogged about Susan. This will be blog number 794, wow what a fun time I have had. Thanks for reading and have a Happy Valentines Day everyone. Susan your nails look really nice. Hope you are feeling better soon. Have a great few days off.